Today is the last day of my first trimester (at least thats what the books have told me), and i thought i would reflect a little on what these past three months have been like. This post is more so for me to remember what it was like, so i won't take it personally if you don't want to read it. Finding out: i was supposed to get my period the saturday before Aaron and I left for Virginia, and when it didn't show i decided to take a pregnancy test (i had one from a time before when i thought i was pregnant) it was negative, so i figured my period was just off. A few days later, Aunt flo still hadn't made her appearance and i started to think maybe the earlier test was wrong. Aaron and i went out and bought another set of tests. After taking it twice and having the line being so faint that you had to squint your eyes and hold it the right way just to see the second line, we were frustrated. "What does this even mean?" We finally sucked it up and bought the expensive digital test, the one that blatantly said "Pregnant" or "Not Pregnant." One minute and twenty seconds later we had our answer: i WAS pregnant! 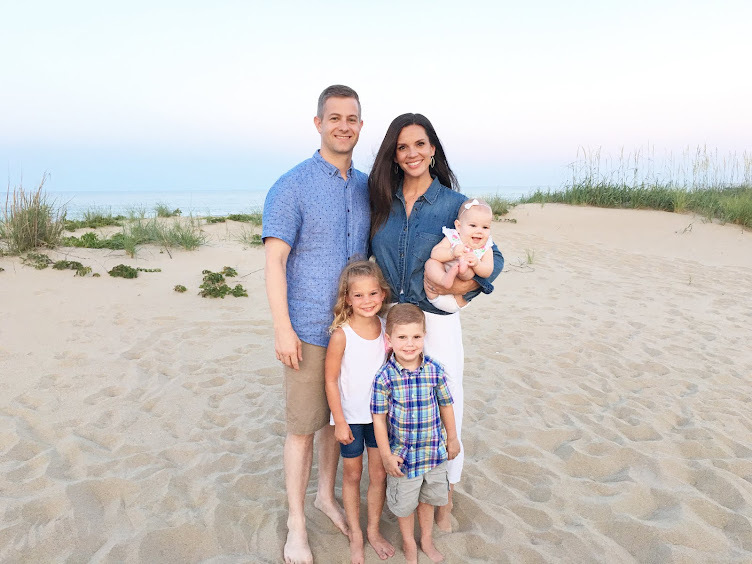 Telling our families was a lot of fun, but we didn't want to tell anyone else because there was still a large possibility of miscarriage. First Appointment: I found a doctor through reviews online and called early to make sure that i could get in to see the doctor around when i thought i was 9 weeks. The receptionist told me that i didn't need to wait that long and could come in when i was 7 weeks. I was really excited to have my first appointment sooner than i thought, but the downside was that Aaron had an inventory count that he had for work rescheduled for the same time as my appointment. After what seemed like a FOREVER long wait it was appointment day. After work i went and had an internal sonogram. The doctor told me after the sonogram we would chat about pregnancy etc and do a couple more tests. She then got right to it. The internal sonogram was awkward, you have nothing on your bottom half and the "probe" is covered by a condom for sanitary purposes. Interesting. As soon as that probe was "in position" this image came onto the screen: My doctor furrowed her brow, moved the probe around some more and then asked me "Are you sure the date of your last missed period is correct?" I panicked. I immediately thought that i was having a miscarriage and the image on the screen wasn't what the doctor wanted to see. I told her that my cycle was 35 days and not 28 which should put the baby younger than she thought. 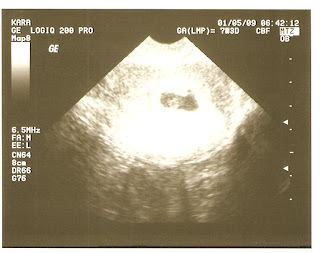 She told me that this was a baby at 5 weeks and that could mean that i ovulated later than i thought, or that the baby wasn't developing past 5 weeks. She stopped everything and said that i needed to have a two day test of my Hcg levels to see if they're going up and that would tell me whether or not i was miscarrying. I burst into tears and i couldn't stop myself. I'm sure i made everyone at the doctors office feel so awkward. I thought for sure that this baby wasn't going to make it. I tearfully got my blood drawn, got to my car, called aaron, bawled my eyes out, drove home, called my mom, and bawled my eyes out again. Two days later i got my second blood test done and i just had to wait for the results. In the meantime i talked to my sisters and my one sister Stacey told me that the same situation happened to her, the doctor thought she was miscarrying she got tested, the tests didn't look good and 8 months later Taylor was born. It was good to hear, but i was still really nervous. Finally i got the results, my heart was beating out of my chest and the results..... were inconclusive. WHAT?!?! You have nothing to tell me?! You still don't know?!?! She said that i needed to wait a few weeks and have another ultrasound. Ugh. MORE WAITING! I couldn't think or talk about the baby without knocking on wood or saying a big "IF." 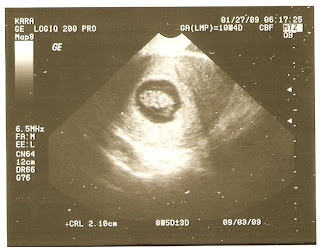 A few weeks later i had my next sonogram. Thankfully Aaron was able to make it to this appointment, i needed him for moral support. I braced myself for the worst and prayed for the best. The probe was prepped, and after a black screen at first, this little gummy bear looking thing appeared. (its looking straight at the camera, the baby loves to look at the probe, its probably thinking 'What the heck is coming at me? ): I was ECSTATIC!!! you could see the little heart beating and the little arm and leg buds. It was a baby! There was a baby there. YES! It was at that appointment that i could finally sit down and talk to my doctor about pregnancy. I went home and enojyed being pregnant without the nagging feeling of "What if" looming. Thoughts: Pregnancy is NOTHING like i thought it would be. I figured that i would be moody, emotional and spending most of my time in the bathroom with my head in the toilet. This was not the case. I was rarely nauseated but i was STARVING all the time. I had to eat every hour on the hour or else i became a ravenous beast. 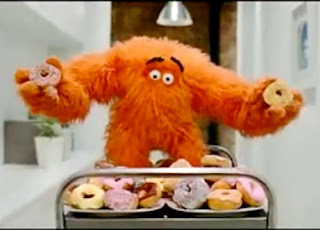 Hungry from the Weight Watchers Momentum commercials was/is my mascot. My face also broke out like nobody's business. I felt like i was going through puberty again. I even started on ProActiv, which has worked like a charm. Finally i was exhausted. I could take a 3 hour nap from 4:30-7:30pm and still fall asleep at 11:00 that same night. It was nuts. And if i didn't take a nap i would be struggling for the rest of the day to keep my eyes open. I was finally thinking that i would go the entire first trimester without throwing up and i was chalking myself up as one of the lucky ones. On the day that i was 13 weeks, one week away from the 2nd trimester, i threw up. I didn't eat soon enough. Thankfully i haven't thrown up since, and i still consider myself to be really lucky that i didn't get morning sickness. I can tell that my major symptoms are starting to fade. I'm not ravenous, my face is clearing up (with the help of proactiv of course), and i'm not nearly as tired. I'm really looking forward to the next trimester and in 6 short weeks we find out what we're having! So first trimester, you made me worry a lot, but thanks for not making me throw up a lot! What a great idea, I need to type up everything too. And ditto on the no nausea, feeling hungry, and acne! I guess I'd rather have those than having to live by the toilet! Congrats again on being pregnant. I'm so glad we are past trimester 1 only 2 more to go!!! YAY! I love your mascot! He was definitely mine also! Can't wait to see you tonight!!!!! Kara! First of all I am so excited you are blogging! (Well I think you have been blogging longer than me but I'm glad I found your blog!). Secondly - CONGRATULATIONS!!! I can't wait to hear more about your little one :) Finally, I see you are currently reading Jane Austin's Persuasion. I'm so proud. I hope you love it! That would have been so scary to have your doctor say that to you! Shame on them for making you nervous for so long! They should have just assumed your cycle latsed longer. That's what mine said. But I told them that my cycle had been off since my miscarriage. Anyways, I am SO happy that everything is good now though! Jealous that you didn't have bad morning sickness! You lucked out!